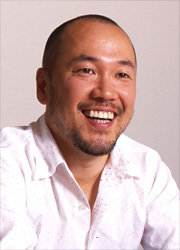 Takehiko Inoue's Slam Dunk is one of the most popular manga in the world. In 2004 Shueisha announced that it has sold over 100 million copies of Slam Dunk, which shows that the series is still being enjoyed by fans around the world 10 years after it ended in Weekly Shonen Jump. A month ago Takehiko Inoue established a new scholarship called Slam Dunk Scholarship. In response to the news, Shueisha interviewed Inoue, who talks about the purpose of the scholarship as well as his passion with basketball in Japan. A new scholarship from Inoue Takehiko, called Slam Dunk Scholarship, was established for aspiring Japanese students planning on attending South Kent School in Connecticut "to learn English, play basketball ball, and try to get into an NCAA team." The scholarship is open to people attending 2nd-year highschool as of this October 06, loves b-ball, is born after April 2nd '89, and has parental consent. Application forms will be availalbe in January 2007. Q: Can you tell us why you established the Slam Dank Scholarship? For a long time now, after Slam Dunk had sold over 100 million copies, I wanted to express my appreciation to basketball. After Slam Dank was finished, I went to live in the U.S. for a while. When I saw NBA games and the American basketball culture, I thought to myself: "successful basketball players are also participating in many social activities, can I do something for basketball?" I discussed this with Shueisha, and two years later I finally ended up creating the "Slam Dunk Scholarship." Q: Why did you establish the scholarship, as opposed to some other kind of contribution to the society? Inoue: To promote basketball in Japan, since its future is in the hands of today's youth. Currently Japanese kids who play basketball will stop once they graduate from high school. Those who are not fans of basketball would ask: "The high school basketball club has so many, and they are so popular with the girls, but do they vanish after graduating? Instead, in American basketball players continue to play in college. The two cannot be compared. Q: Why do you think college basketball isn't popular in Japan? Inoue: How many talented high school students in Japan can make a living as a professional basketball player? There is a professional basketball league called BJ league, but I have to say, it's not as dominant as baseball or soccer. The kids can't see themselves becoming professional basketball players. Q: We heard that the scholarship includes a program of spending a year to study in a U.S. prep school. Inoue: I thought about having the student stay in an American university. NCAA doesn't allow students to play in its regular games without consistent grades from school, so the students might not be able to play due to their language skills. Many Japanese people probably don't know about prep schools. Prep school's purpose is to prepare high school graduates for universities and higher education. Prep school lets the student play basketball while studying English, so many overseas students who want to participate in NCAA or another professional league goes there. Q: So is the prep school the door to NCAA or a pro basketball league? Inoue: Scouts like university basketball coaches come to prep school to scout players. If a player attracts the eyes of a scout, he might have a chance at receiving a sports scholarship and play in NCAInoue: All I can offer is an opportunity; the students need to do the rest by themselves. Q: What about Yuta Tabuse, a first Japanese NBA player? Inoue: He is great. His height is 173 cm, even among American players, only one player a year with his height gets to enter NBA each year. Right now he is facing his challenges in NBA while also playing in a minor league, it really is not easy. Sure, getting older will give him a handicap; the coaches can look at him with and say: "I need players under 22 or 21 years old." I guess Tabuse is making progress, as I used to, I'll be a fan of his from now on as well. Q: You lived in Los Angeles for a year. What's the difference between U.S. and Japan? Inoue: I felt a gap in the status of sports. In the U.S. basketball is not just an amusement; it's a necessity in life. Top players have responsibilities in the society and are respected. On the other hand, in Japan, basketball games aren't treated with respect. People evaluate basketball games based on television ratings. Q: Yes, over the years in Japan sports programs on TV are becoming variety shows. Inoue: It's getting worse. If adults show such attitude toward the sport, kids won't be able to truly understand the sport. The kids should know the true value of the sport. In Los Angeles, there is a basketball court in every park, and many homes had basketball court as well, so people can enjoy playing basketball any time they want. Q: There were a lot of foods, right? Inoue: Terrific! At first I wondered if they were joking. At Starbucks, a "grand size" in Japan is equivalent to a "tall size" in the U.S., there is a huge gap in terms of the volume of foods. I was bewildered at first, but later got used to it and was able to finish everything. Q: What about the different lifestyle? Inoue: If you insisted nothing, you would be ignored. I think the students we will be sending will learn many things about life by living with students from another culture. Q: Do you think athletes need an ego? Inoue: I guess... In the U.S., ego is also not a good thing. Kobe Bryant was often criticized for his selfishness. I just think the definition of "ego" is different between the U.S. and Japan. In Japan, to have ego as a necessity for players to win is something that receives criticism. Q: Do you have any example? Inoue: I saw a lot of ego during the World Basket Tournament in this summer. With just a few seconds left, Sakurai Ryota from Team Japan got the ball right under the basket in the Japan site of the court, and he dribbled the ball to the other side of the court and made a shot. 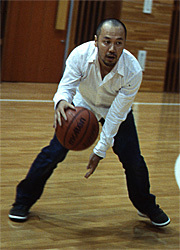 In such cases, most players would pass the ball, but Ryota kept the ball and ran toward the other side of the court. I thought it was a fine play; it showed Ryota's faith in himself and his spirit. Q: I watched it too, he was awesome. Inoue: Yes, he was awesome. That was a "good" ego, and as a result, it encouraged and gave momentum to his teammates. Q: It felt like the World Basketball Tournament didn't have as much appeal compared to World Cup Soccer. Inoue: As a basketball fan myself I have to say that's a regrettable thing. Besides the result of the games (1 win, 4 lose), I believe Team Japan did their best. Japanese basketball and soccer are almost equal in rank in the world. Q: Were there a team or player that impressed you? Inoue: I only watched some games, so I can't say anything about all the teams. I was impressed with player No.4 of the Greek team, Papaloukas. As for teams, the winning team, Spain, and the runner-up team, Greece. They had effective passes, many of which resulted in three-point shots. Many people think America is the biggest basketball country in the world; however, in this tournament Europe overcame the U.S. I felt that I need to know more about European basketball. One of the strength of the World Tournament was the amazing performance of European teams. The event erased the common believe that the style of NBA is the best. This tournament showed the European FIBA style as the world standard style for us. NBA's style places emphasis on individual players, it's hard for Japanese players to adapt due to their physique and power. In this world tournament, the U.S. team can't win as easily. The purpose of the Slum Dunk Scholarship is to have the student first enter a university in the NCAA league, but it's not the only way. European league is another option. The way Japanese basketball is developing is closer to FIBA's style than NBA's. Q: If you have the power to create a system for Japanese basketball, what kind of system will you create? Inoue: What a question... I think the baseball teams should have their root in the community. Basketball as an amusement for people who live around there, players and people can support each other. We could feel a "regional consciousness" when we watch high school baseball games. The "regional consciousness" is a considerable power. Of course, we would also need sponsors. Q: Do you have a business model for the teams? Inoue: The club teams system in Europe. The pro team is at the top, and the kids team is at the bottom. Selected kids can play with the same uniform of the pro team, and kids play with the goal of becoming professional players. The steps to creating such system are very...yeah. It's just my dream. I need to think about realistic plans. With the Slam Dunk Scholarship, the student who goes to U.S. will feel that American basketball very far ahead of Japan, but he will also find something to which he can say: "I also learned useful things in Japan, and I can use them." I hope the student will use his experience to improve Japanese basketball, that is my purpose in the long run. Everything won't change right away, but we can move ahead bit by bit. All I want is to offer the opportunity to the players so they can improve their skill, and have gain experience. Q: You really do love basketball. Inoue: Um, honestly, now that I'm not creating a basketball manga, I don't to watch the games as eagerly as I used to. When I was creating Vagabond, I was not able to watch any game at all. My passion came back to me when the Lakers achieved 3 wins in NBA, and now my passion come back with this World Tournament. I want to go to the games; I have to watch the European basketball games. Q: In the end, the Slam Dunk Scholarship is recruiting high school students who will graduate in March of the year after next. What kind of things were you when you were their age? Inoue: Nothing (laughs). I hadn't made the decision to become a mangaka. I just went to school and played basketball. I was on my school's basketball team. I enjoyed it, hardships never mattered to me. Our team was not good, but we were able to enjoy our progress. In my high school life, I made an effort, I made some progress, I was not able to make certain progress, I won, I lost... I experienced many things as I grew. Our team's result was poor, but I was able to learn something from it for three years. It was very important for me, so I have to appreciate basketball. *A few questions were ommited in the translation. Submitted by Carolyn Hastings (not verified) on Fri, 2008-07-25 13:40. Thank you for translating this article. Basketball is a universal language and I'm happy to learn about Japanese students coming to the US for this purpose. What a wonderful mix of cultures. The US needs to be a little more modest and the Japanese experience that in some cases, ego is not a bad thing. A good friend of mine lived in Japan for twelve years (she is originally from India) and I have fallen in love with Japan through her stories. Submitted by team building consultants (not verified) on Fri, 2008-11-21 05:28. As an expression of his appreciation to the sport of basketball Mr. Inoue established the Slam Dunk Scholarship for aspiring Japanese students who play basketball ??? a sport which Slam Dunk single-handedly helped to popularize in Japan.